Last Tuesday at around 3:30 pm, a 93-year old water main under Sunset Boulevard ruptured, spewing as much as 75,000 gallons of water PER MINUTE into the air. 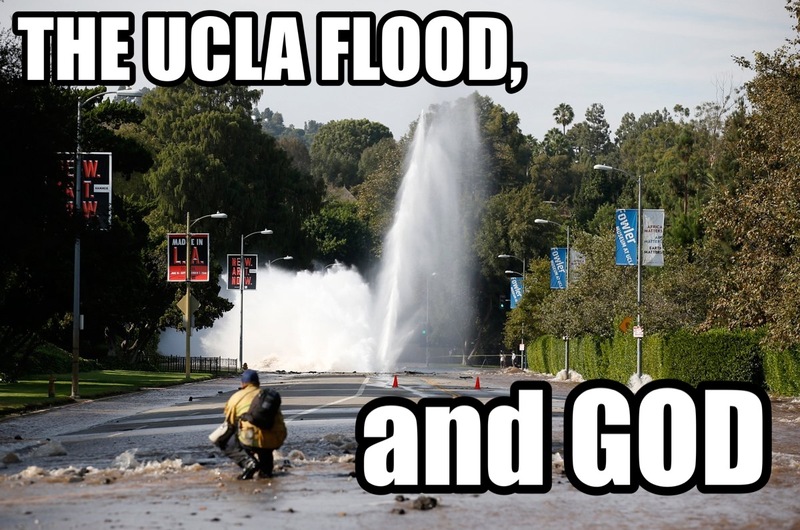 The millions of gallons have flooded the surrounding areas, including UCLA and their newly renovated Pauley Pavilion. Video footage of the event is spectacular, with the geyser of water skyrocketed over thirty feet into the air and capsizing the street into an ever-growing sinkhole. And surprise, surprise, hearing about this made me think of God and the bible. In both of these episodes, the children of Israel are wandering the desert and complaining (an apt description of most of the Old Testament), so God graciously and miraculously provides water for them from a nearby boulder. We typically imagine a gentle stream softly flowing towards the people, as if it were a calm summer day and we were in the latest Nicholas Sparks flick. But how much water was actually flowing? Most estimates place the population of Israel at this point between 2 million to 7 million men, women, and children. We are also told that they took all of their flocks and herds when they left (Exodus 12:30-32). Furthermore, Psalm 105:37 says that the Israelites left rich with silver and gold, them and their cattle in good shape. We don’t know how much cattle they had, but it doesn’t seem to be a small amount. And God provided water for this entire crew, from a single rock. Applying the lowest of these numbers to the 5,000,000 person population of desert-wandering Israel, there would be 72,912 gallons of water per minute flowing from that rock. It’d be a sight comparable to the Sunset Boulevard geyser. Of course, we don’t use water like they used to. We waste water on frivolous things like dishes and gardening. Surely the Israelites didn’t require as much as we do. Can we get a more accurate number? The average person needs three liters of drinking water a day, or about 0.8 gallons a day. For 5,000,000 people, that’d be 3,961,500 gallons a day, or 2,751 gallons a minute. While today we use about 25 gallons of water per shower, the lowest estimates I was able to find for necessary bathing water was 3 gallons per shower (it’s called a Navy shower, and I think it’s applicable; after all, soldiers in the desert probably use as little water as possible). And whereas we shower daily, I read on some hippy website that the healthiest way to bathe is to bathe only once a week. Assuming that’s true, 5,000,000 people bathing only once a week with no more than 3 gallons of water per scrub would be 2,142,857 gallons per day, or 1,488 gallons per minute. Now what about the animals? First, how many animals were there? The text doesn’t tell us. However, using some creative reasoning, we can make an educated guess for the number of animals they needed to water. Job 1:3 tells us that Job has 7,000 sheep, 3,000 camels, 500 yoke (or pairs) of oxen, and 500 female donkeys, for a total of 11,500 animals. Proportionally, his animals consisted of 61% sheep, 26% camels, 8.7% oxen, and 4.3% donkeys. Sheep require 2 gallons of drinking water a day, while camels need 30 gallons, oxen need 40 gallons, and donkeys need 10 gallons. That means the average Israelite animal needed about 13 gallons of fresh water a day. We know that the Israelites left richly with not only their own possessions but with many possessions given to them by the fearful and defeated Egyptians. The biblically rich had animals numbering in the thousands, but to be extremely conservative, let’s assume the average family of four had four animals. That’d be five million animals roaming around the wilderness with them, each needing an average of 13 gallons of water per day. (If you think this is an overestimate, I assumed 9 cows for every 100 Israelites; in the US, there are 12 cows for every 100 Americans. Seems like a fair estimate). That would amount to a staggering 65 million gallons a day, or 45,139 gallons per minute. Finally, it’s worthy mentioning that the Israelites wouldn’t’ve used every single drop of water that erupted from that rock. How could they? It was flowing through the desert sands like a river. Much of the water would be too dirty to drink. In fact, estimates on the efficiency of a modern drinking fountain are pitifully low. Chances are that at least half of the water provided remained unused. All things considered, we are looking at about 98,756 gallons of water per minute flowing from the rock to the thirsty Israelites. That is a conservative estimate, and it doesn’t include any water the Israelites would’ve collected for later use. No wonder Moses described the waters as flowing out “abundantly,” no wonder the psalmist later wrote that the waters “gushed” forth! In fact, the Hebrew word for “gushed” in Psalm 105:41, when transliterated into Greek, is quite similar to the New Testament word used to describe violent torrential floods which threatened to flood houses along the river. My whole point is we should consider how silly it is to think that God isn’t big enough to meet our needs or answer our prayers. Whatever you need, God invented it! He described Himself as El Shaddai, the God who is more than enough! This busted water main is making national headlines. A bunch of water is flowing out of water pipes in one of America’s most prestigious and well-manicured college campuses. Compare that to God, who had the power to make an even greatest amount of water flow out of a giant stone wall in one of the driest and dustiest corners of the planet. And He did it multiple times. I think God’s big enough to put dinner on your plate tonight. When your wife tells you to hide the eggs but there are a thousand eggs and you’ve run out of hiding places. Shout out to my amazing son, who has had an incredible week: - he read a book all my himself - took his first piano lesson - started T-ball - got his stitches out And you won’t believe what he has planned for next week!